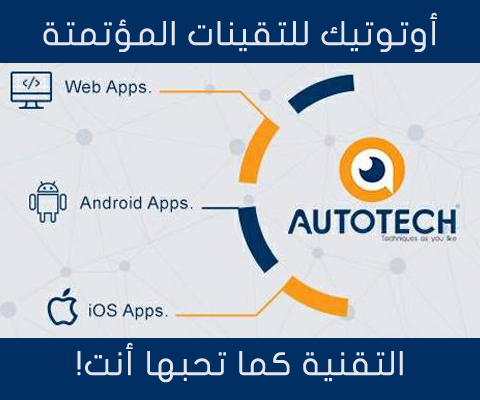 "Damascus-based AutoTech company founded in 2015, specializing in the field of Windows , Web and Mobile Apps solutions. AutoTech's vision: As long as you're in the era of speed and the digital, then there would be a solution to any problem you experience! The company aims through its work to enable different users, companies and public and private sectors to take advantage of automation features, taking into account the enormous development and rapid hardware and techniques." Web solutions can be made by different programming and services that meet all of your requirements. Since our experience in the field of web programming offer the best algorithms, designs, and all compatible displays. Mobile applications is the best way to communicate and interact with the public directly, so we offer the best solutions. Application design guarantees you success in your business and the wider proliferation. Google Play Store is waiting for your application! Because of the competition fierce among the Android supporting companies and Apple which support system iOS, we make your application on both platforms Android and Apple and we give you all the support to reach your news and your products to customers. Apple store waiting for your application! © Autotech co.2017 All rights reserved.